“The year has been awesome! Absolutely awesome,” Murphy said Monday night. “I don’t know if I’ve ever been a part of something so special. Our team is so close and we enjoy each other so much it feels like the year has flown by. In the offseason and early on in September we knew all the potential we had. That’s always been Murphy’s modus operandi. He spent so much time in the gym during his MHS years it’s a wonder his mail wasn’t delivered there. Despite being generously listed at 6-feet and 180 pounds, Murphy willed himself into one of the best points guards in Wisconsin. Murphy became Middleton’s all-time assist leader with 280 and finished his career with 1,094 points. Murphy was a first-team all-Big Eight Conference selection his final two seasons and earned honorable-mention all-state honors as a senior from the Wisconsin Basketball Coaches Association. “Storm is a one-in-a-lifetime player with the highest overall skill set I have been privileged to see day in and day out,” Middleton coach Kevin Bavery said of Murphy. 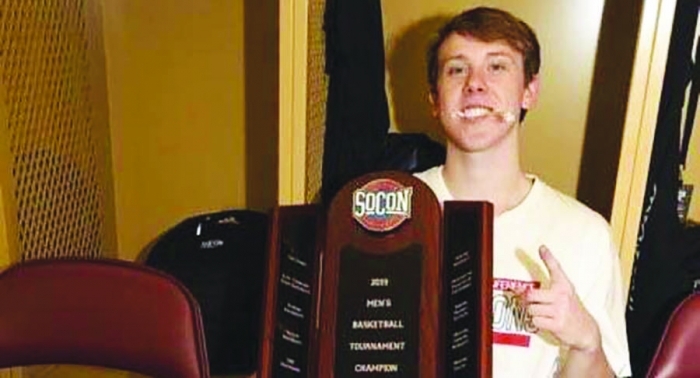 To the surprise of no one, Murphy has found immediate success at Wofford, too. Murphy started 29 of 34 games as a freshman where he averaged 6.3 points, 4.0 assists and 2.2 rebounds in 27.4 minutes per game. The Terriers also stunned the basketball world that season by upsetting North Carolina in Chapel Hill, N.C. and eventually reached the CIT Tournament. Amazingly, things have gone even better in 2018-’19. Murphy leads the team in assists (3.2), is fourth in scoring (8.0) and third in three-point field goals made (47). Murphy is shooting 50.8% from the floor, 48.5% from beyond the arc and 84.4% from the free throw line. Murphy’s ability to set up Wofford standouts Fletcher Magee (20.5 ppg), Cameron Jackson (14.6) and Nathan Hoover (13.3) has gone a long in Wofford’s sensational season. “I feel this season has gone really well personally,” Murphy said. “I have had a blast. Being a sophomore I’ve been able to step up into a little more of a leadership role. It’s been awesome having such great seniors on our team who lead by example and really push us. I feel I’ve tapped into that a little and know I will continue in the coming years. Wofford has stepped up as much as any mid-major in the country in recent seasons. The Terriers have played a daunting out-of-conference schedule to get themselves ready for March. Wofford defeated South Carolina of the Southeastern Conference, 81-61. The Terriers four losses have come against North Carolina, Oklahoma, Kansas and Mississippi State — four teams that all qualified for the NCAA Tournament. The Terriers have showed that all season. Wofford defeated reigning conference champion UNC Greensboro by 29 and 30 points. The Terriers also rolled through their league by an average of 16.9 points per game. Wofford hasn’t lost since falling to Mississippi State on Dec. 19. And the Terriers jumped to No. 20 in both the AP and ESPN/USA Today Coaches Polls, the program’s first-ever national ranking. So selection Sunday was a day of celebration at Wofford. Now, Murphy and the Terriers hope to make even more history. Wofford is 0-4 all-time in the NCAA Tournament. The No. 7 seed attained by the Terriers, though, is the best seed given to a Southern Conference team since 1979. Wofford meets 10th-seeded Seton Hall, which won four of its final five games and reached the Big East Conference finals before losing to defending NCAA champion Villanova. If Wofford wins there, a likely second round date with Kentucky awaits. Murphy knows the Terriers will need to be at their best to make some noise this weekend. But Wofford has prepared all season for this moment, and can’t wait for its big opportunity. “I feel great about our matchup with Seton Hall,” Murphy said. “I’m really excited. They have some great talent and play in a great conference, so it will definitely be a great game.